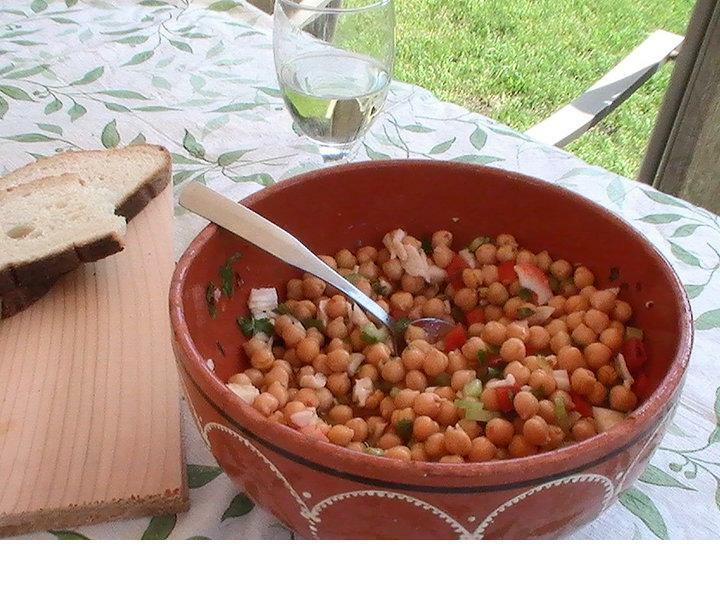 Portuguese Cook's Blog | Food, wine and culture from a Portuguese Canadian. Soak the cod overnight (24 hrs), then next day place it in a saucepan, half filled with water, boil for 10 to 15 minutes. Remove from pot, drain the cod, debone and remove skins from the fish. Then flake it and set to the side. Meanwhile, dice the onions, minced garlic and saute in a fry pan with about a 2 tablespoons of light extra virgin olive oil. Boil potatoes (white or russet) with skins on, then peeled and cut into quarters, eighths or slices. Mix in the drained, flaked cod. Add the fried onions and garlic. Add your salt and pepper to taste. Add 2 tbsp. of olive oil. Add your glass of white wine to the mix. Stir everything in. Taste again. Lightly cook on the stove for 5 minutes on medium high heat. 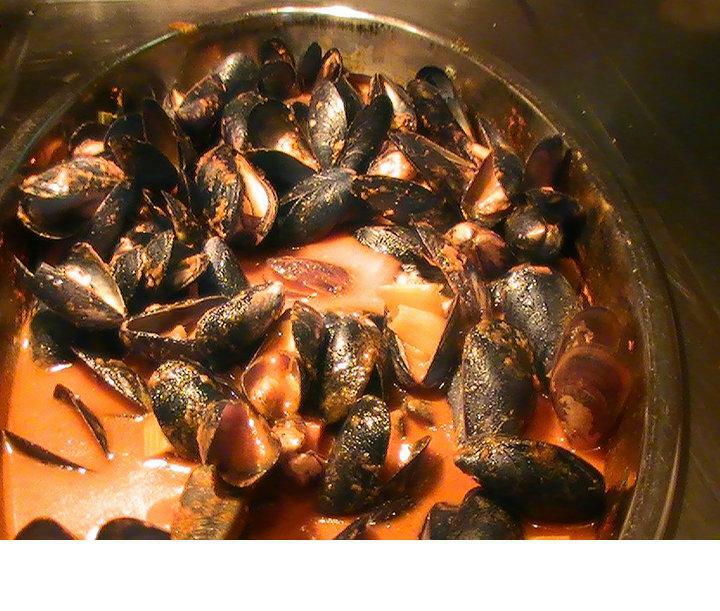 Pour immediately in a clay casserole dish, and bring to a hot oven at (350 to 375 degrees F) for 10 to 15 minutes until lightly crisp on the top. Serve on a warm plate, sprinkled with chopped parsley. 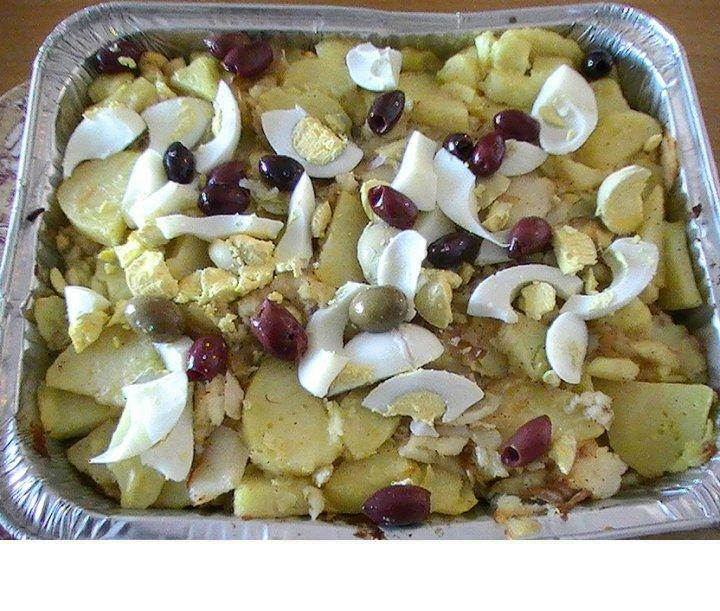 Garnished with slices of boiled eggs and pitted black olives. Enjoy this dish with a glass of Vinho verde or any favourite white wine. For a visual demonstration, check out the video on Youtube. Look forward to any of your comments. As with most of the Portuguese recipes I have written in my blog, one common ingredient that crops up is the use of pimento paste. What is this “pimento paste” you ask ? A very special concoction with an interesting history. The pimento or pimentão, is a bell pepper, also known in Latin as Capsicum. The “pimentão” or large bell pepper, botanically known as fruits, although generally considered in the culinary world to be vegetables. There is also the cherry pepper which has commonly been referred as pimento in the English speaking world. The pepper is mainly used in creating the red filler for Spanish olives and not to be confused with the Pimento traditionally used by the Portuguese in their paste. In fact, it’s the red bell pepper that has been widely used in the making of pimento pastes within the Portuguese community. 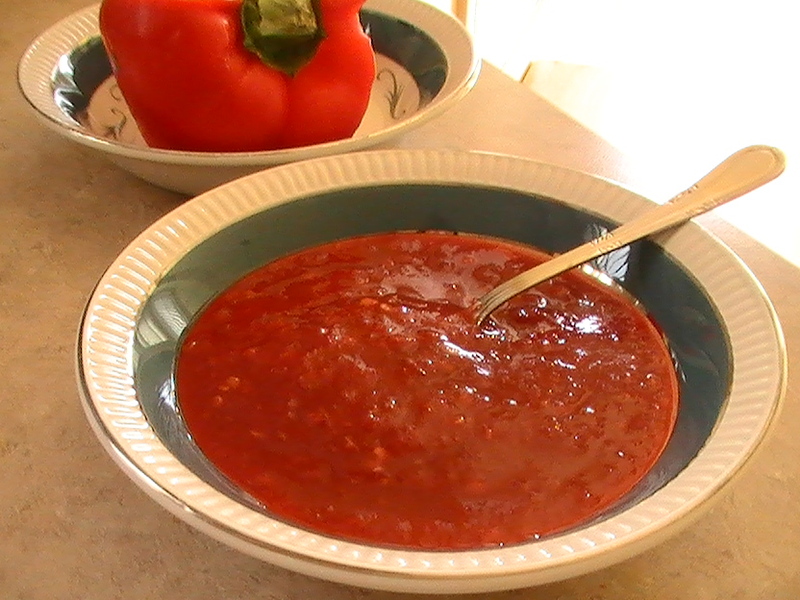 Some Portuguese natives refer their paste as “Pimenta Moida” the second word pronounced mo-wee-da, which translates to ground or puréed pepper. There are two main available textures: The Incopil brand, which is a deep red thick paste similar to that of tomato paste. The other widely commercialized paste has a more liquified consistency which includes sparse remnants of the yellow seeds. Some brands of the paste available in the Ontario market are Ferma, Borges and Atlantic. In the U.S. there’s Corisca and Incopil, just to name a few. In both of these textured varieties, there’s a high sodium content, which would reduce the need for additional salt as you cook. Typically these sauces are available in “sweet” and “hot” taste intensities. Some Portuguese food connoisseurs refer the very hot sauces as ‘Malagueta’ pronounced mal-ah-ghe-tah. Which again the use of red peppers although the “hot” genus plants Portugal peppers are incorporated into the mix. According to my experience in the Portuguese Canadian culture, these sauces, (both sweet and hot), were made at home during the fall harvest season. The traditional gathering of farm bushels full of red peppers bought at local farmer’s markets and specialty stores. Washing and preparing the peppers to be fed through a meat grinder, followed by adding coarse sea salt to the red liquid, and then transferring into sterilized jars, a very time-consuming process. Although the end product, a well used cooking and table condiment in most Portuguese kitchens throughout the year. 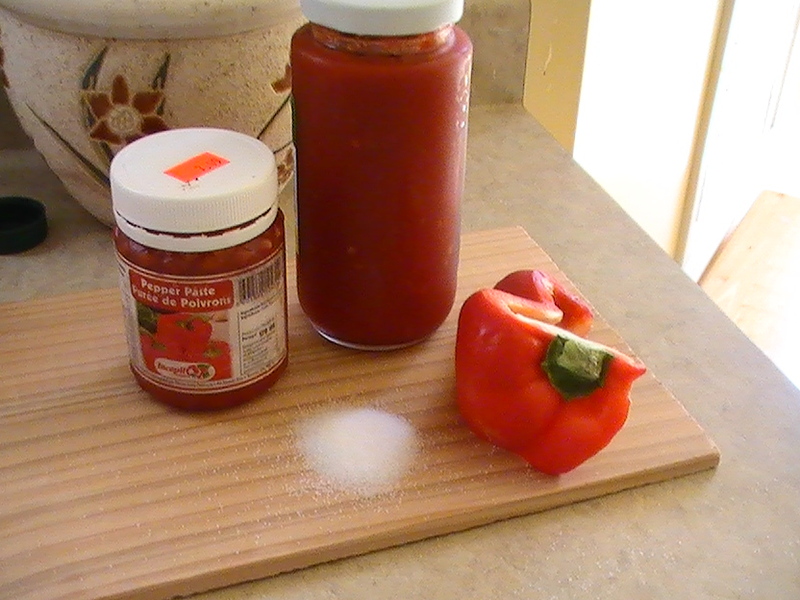 Today most people buy their pimento paste at Portuguese food stores, online sites and large well stocked grocery chains such as Fortino’s and Metro. These wonderful authentic food enhancers can cost between $2 Cdn. to $3. US depending on the supply and demand of the region. So if you want to add some Portuguese authentic flavour to your everyday meals, don’t forget to add a little ‘Pimento paste’ to your food shopping cart … or as some Portuguese would say ” Pimenta Moida“. In my view, it’s like having “the essence of Azorean cuisine” in a jar. Okay this may not be a Portuguese old style cake…or is it ? I will let you decide on that after reading the recipe. Really if you think about it, eggs happens to be a key ingredient in many Portuguese desserts…so there you go ! Enjoy ! (optional) kahlua liqueur about 2 or 3 tbsp. 1)Making the cake: in a large bowl, crack open 6 eggs, add the water, oil, vanilla, sugar, brandy or scotch. 3)Slowly add your dry ingredients: flour, magic baking powder, salt and stir with a wooden spoon. 4)Pour into a bundt cake baking pan that has been greased and floured. 2)Add your coconut extract, your brandy, lemon rind, whisk a bit more than pour into a medium sauce pot on medium low heat. 4)You shall stir slowly until it’s a smooth semi-pudding consistency, about 15 minutes of heating and stirring (more or less). 5)Set to the side. Let it cool for about 10 min. 3)Add the custard on that half to be about 1/2 inch thick. 5)Put the other half of the cake on the bottom half. 6)Pour the remaining custard cream over it, it will shield the whole top of the cake . Then add the other half of your strawberries. 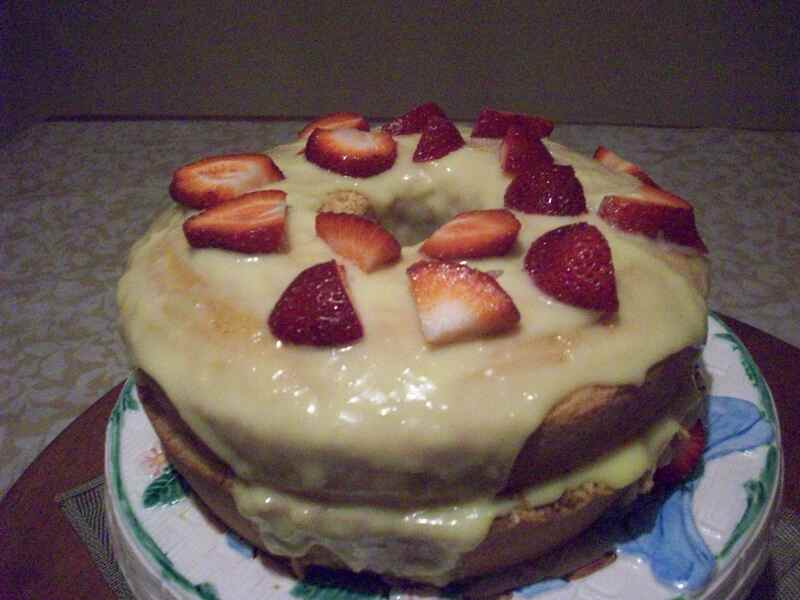 As indicated the coffee & Kahlua is purely optional…Feel free to make it as my original way by just using the custard & strawberries ! And there you have it….my most favourite, classic old-fashioned strawberry Custard cake….Even Marie Antoinette would be proud. ! Last year when my mom was visiting, we sometimes create meals at a moment’s notice, especially in the summer. I was growing Italian broad green beans, they are so delicious especially in stews. 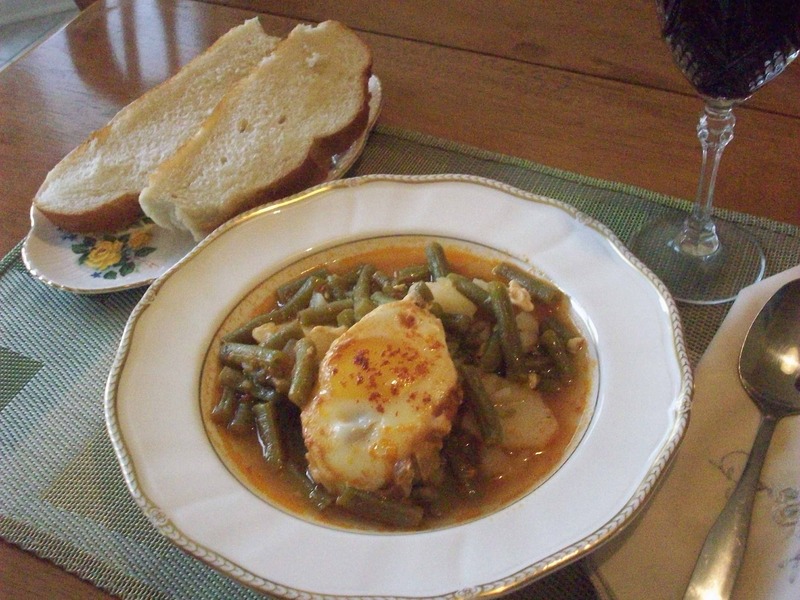 My mom showed me how to make one of my favourite stews, a green bean, potato & egg stew. Just amazing the aromas that emanate through the kitchen while this stew slowly cooks. This is actually a great summer favourite, especially when the green beans are in season…and even better when you picked them fresh from the garden. This stew is so flavourful, satisfying and full of nutrients, protein and comfort. 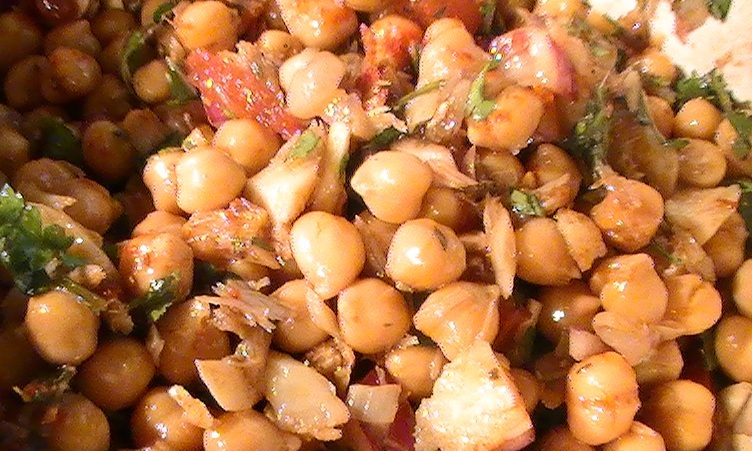 Enjoy a little homestyle vegetarian dish with a dash of Portuguese charm !!!! a few leaves of cilantro (optional) towards the end. 2)Add your water, should reach about 1/3 the pot. Add your vegetable bullion cube. Let it boil a couple of minutes. Keep the heat to medium, overall. 3)Add your green beans, sliced up potatoes, (cut in 1/8ths)., bay leaf, tomato paste, red sweet pimento sauce, bay leaf, cummin. Let it boil for about 1/2 hr. Stirring occasionally. 4)Towards the last 5 minutes, add the eggs by crack them into the simmering stew. A pinch of coriander & salt & pepper to taste. 5)Let it simmer until the eggs are over easy or hard-boiled.. however you normally have your eggs. Add some cilantro leaves in the stew. 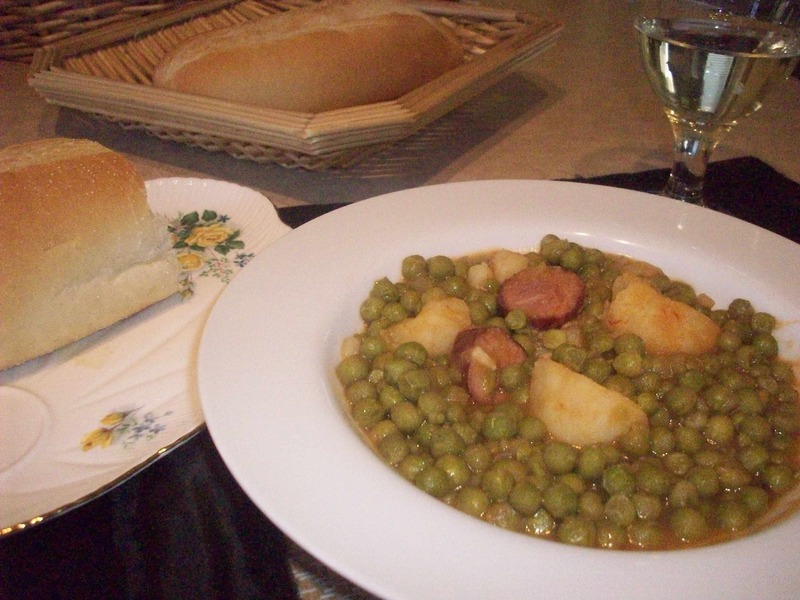 Enjoy this wonderful homestyle comfort food with a nice glass of red wine or Portuguese beverage Sumol, and don’t forget your favourite home style bread !!! These puffed pastries are so simple to make, they will make your head spin. I remember my mom making these when I was a little wee girl, I loved rolling out the dough, then I would watch her cut the dough into triangles. I have not made any new adaptations to these babies, only instead of grand marnier liqueur, I put a shot of good old-fashioned brandy. 1/2 cup of sugar & cinnamon for dusting on top of the pastries. 1) In a med. bowl, add your flour, egg, water, brandy, salt and mix with a wooden spoon. 2) Once it’s been mixed, it will be very sticky and hard to stir, you would need to add more flour and use your hands to round it into a ball. 3)On a cutting board or clean counter, dust some flour, and start to knead to dough, keep it the ball shape as if you are making a pizza. Knead for 5 minutes or until dough is ready to roll out. 4)Roll out the dough with a dusted rolling-pin, roll it out very thin about the thickness of 4 or 5 sheets of paper. 5)Cut into rectangle or triangle shapes, lay them on the plate. In the meantime, add the oil to the frying pan. Put the temperature to medium or my stove has no. 6 on the dial, let it heat for about 5 to 10 minutes. Test 1 pastry slice into the pan to see if it’s ready…you’ll know when the pastry is bubbling. 6)Add your pastry triangles or rectangle shapes, let them bubble, about 3 or 4 minutes each side. You want them a very, very light golden white colour. 7)Transfer them to a plate with some paper towel so the oil can be absorbed. Then dust your sugar and cinnamon lightly over top. These treats are great with milk, coffee or tea. My kids just love these with a glass of milk. One is never enough. Makes a great snack for afterschool or a lunch box treat ! Enjoy and let me know how they turn out !